manually specify a path to a driver update image or an RPM package. Always make sure to put your driver update discs on a standard disk partition. Advanced storage, such as RAID or LVM volumes, might not be accessible during the early stage of the installation when you perform driver updates. To have the installation program automatically recognize a driver update disc, connect a block device with the OEMDRV volume label to your computer before starting the installation process. 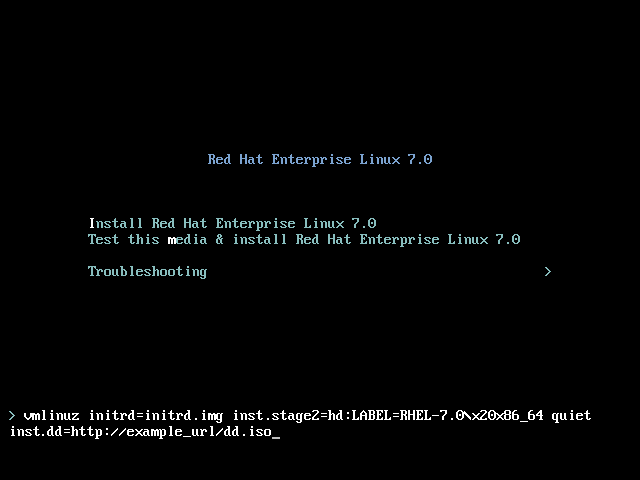 Starting with Red Hat Enterprise Linux 7.2, you can also use the OEMDRV block device to automatically load a Kickstart file. This file must be named ks.cfg and placed in the root of the device to be loaded. See Chapter 26, Kickstart Installations for more information about Kickstart installations. Use number keys to toggle selection on individual drivers. When ready, press c to install the selected drivers and proceed to the Anaconda graphical user interface. It is always recommended to have a block device with the OEMDRV volume label available to install a driver during installation. However, if no such device is detected and the inst.dd option was specified at the boot command line, the installation program lets you find the driver disk in interactive mode. In the first step, select a local disk partition from the list for Anaconda to scan for ISO files. Then, select one of the detected ISO files. Finally, select one or more available drivers. The image below demonstrates the process in the text user interface with individual steps highlighted. Hit number keys to toggle selection on individual drivers. When ready, press c to install the selected drivers and proceed to the Anaconda graphical user interface. Typically, the image file is located on a web server (for example, http://server.example.com/dd.iso) or on a USB flash drive (for example, /dev/sdb1). It is also possible to specify an RPM package containing the driver update (for example http://server.example.com/dd.rpm). When ready, hit Enter to execute the boot command. Then, your selected drivers will be loaded and the installation process will proceed normally. Note that the drivers blacklisted during installation using the modprobe.blacklist= boot option will remain disabled on the installed system and appear in the /etc/modprobe.d/anaconda-blacklist.conf file. See Chapter 22, Boot Options for more information about blacklisting drivers and other boot options.